Fu speaking at the forum. KUCHING: Sarawak can work with Chinese companies from China on implementing the recently proposed Light Rail Transit (LRT) system. China’s consul general in Kuching Fu Jijun said Chinese companies from China had experience in building light railways and could offer professional help in designing, constructing and maintaining them. 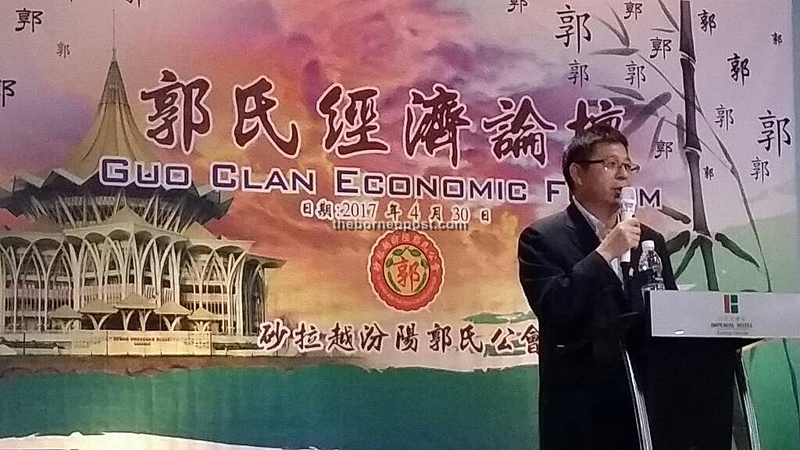 He said this as one of the speakers at the Guo Clan Economic Forum held at the Imperial Hotel here today in response to the recent proposal by Chief Minister Datuk Amar Abang Johari Tun Openg. “Chief Minister of Sarawak Abang Johari had recently proposed to build an LRT system to connect Kuching, Samarahan and Serian. Chinese companies are experienced in building railways and can offer professional help once the Chief Minister makes a decision. “Once the Chief Minister decides to build the light railways, and work with Chinese companies, I believe it will not take a long time to complete the project,” said Fu. On March 18, Abang Johari said an LRT system was being studied for inclusion in the public transport plan to solve traffic congestion in Kuching, Samarahan and Serian. He added that the LRT system would provide easy access for locals and tourists to destinations within the three divisions, especially places of interests within the southern tourism corridor.